Blue-veined cheeses were apparently discovered by accident, when a small French cheese maker found blue mold growing on several of his cheeses. He tasted them, enjoyed the sharp flavor, and decided to produce them purposefully. The popularity of this new type of cheese exploded, as people discovered its pungent, salty taste. 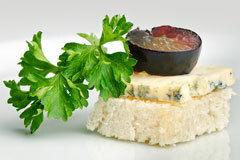 New varieties were developed, and today blue cheeses encompass a range of textures and flavors. The creamiest ones tend to be fairly mild; soft, crumbly varieties usually have the strongest flavors; and firm blue cheeses are generally fairly mellow and earthy. To make blue-veined cheeses, penicillin mold, usually Penicillium roqueforti or a similar strain, is added to milk along with rennet and lactic ferments. The resulting curds are cut, salted, placed in molds, and moved to cellars to ripen. Long steel needles are used to pierce the cheeses, allowing air circulation in their centers; this promotes the growth of the mold into the characteristic blue-green veins. Blue cheeses are usually made from cow's milk. 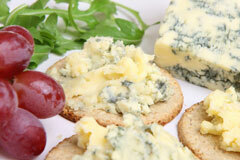 The one exception is Roquefort, often considered the "king of cheeses," which is made from ewe's milk. Some other well-known blue cheeses include Stilton, produced in the English counties of Derbyshire, Leicestershire, and Nottinghamshire; French Bleu d'Auvergne; and crumbly Italian Gorgonzola. Piquant blue cheese is often enjoyed in salad dressings and dips, as well as finding a more sophisticated place on dessert platters aside fruit, an ideal complement to its pronounced flavor. It is also used in pasta and vegetable dishes. 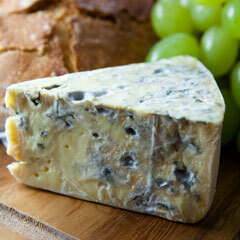 Blue cheese spoils easily; when serving it, set out only as much as will be consumed. These fragile cheeses should be stored wrapped in foil in the bottom of the refrigerator to protect their distinctive flavor and delicate texture. Maytag Dairy Farms has produced handcrafted, cave-aged cheeses since 1941. Often considered to be America's best blue cheese. House of Castello. For over three generations, House of Castello (originally called Rosenborg) has offered fine blue cheeses, with flavors ranging from mild and creamy to distinctively tangy and sharp. Rogue Creamery is an artisan cheese company producing world champion blue cheeses in the Rogue River Valley of southern Oregon. Roquefort Soceite. Since 1863, this French company has crafted quality roquefort cheese. (In French).